Hair analysis is a promising tool for routine clinical screening and diagnosis of heavy metal exposure and essential trace element status in the human body. Systemic intoxications have been identified by anomalously high values of toxins in hair samples. The aim of the present study is to evaluate the relationship between smoking habit of the family members and the levels of toxic and nontoxic trace elements in hair samples of children. The randomized cross-sectional controlled study comprised of 95 children (41 girls and 54 boys) between the ages of 1 and 6 years. After written informed consent was obtained, a face-to-face interview was conducted with the families about educational background, total income of the family, and smoking habits of family members. The mineral elements considered in this study were Zn, Se, B, V, Co, Mo, Mn, iron (Fe), Be, aluminum (Al), As, cadmium (Cd), lead (Pb), Hg, chromium (Cr), Ag, Be, nickel (Ni), copper (Cu), Sn, and antimony (Sb). Hair mineral contents were measured by inductively coupled plasma–mass spectrometry. The results showed that the levels of Cd, Pb, Cr, Sb, Fe, and Al in hair samples of children whose parents smoked were significantly higher than those whose parents were nonsmokers. The number of smokers and the frequency of smoking at home were positively correlated with Pb, Cd, Cu, Ni, and Sb levels found. At the same time, it was found that there was no correlation between toxic element concentrations and family income or educational background excluding the levels of Cd. 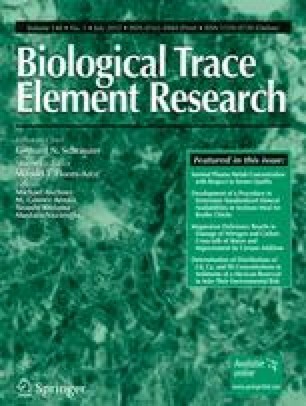 A correlation was observed between the smoking status of family members and levels of toxic trace elements in hair where this correlation was more significant with the levels of Pb and Cd. High socioeconomic status and the level of education of family members did not have any effect on toxic trace levels in hair samples of children.